Worrying or generalised anxiety disorder? We’ve all experienced what it’s like to feel worried - that on-the-edge-of-our-seats worriedness when we await important news, or the in-the-background worrying about how we’re going to run our daily lives set against our stressful modern day lives. Add to that mix worrying about things such as upcoming exams, meeting our new partner’s family for the first time, our friends’ health and wellbeing… the list of things to worry about are endless! There comes a point, however, when worrying moves from being more about ‘things to think about’ into a worry spiral that affects our wellbeing, mental health, and our ability to function. That’s when we consider whether we’ve tipped into Generalised Anxiety Disorder. So what’s the difference between worrying and Generalised Anxiety Disorder? The worries are chronic, appearing for more days than not, for at least 6 months, related to a number of events or activities (e.g. work or school functioning). The worries feel hard to control, as if you’re under siege from your worries. The worries are accompanied by three or more of the following physical and cognitive symptoms – restlessness or feeling on edge, being easily fatigued, problems concentrating/mind going blank, irritability, muscle tension, and sleep difficulties. The anxiety, worry, or resulting physical symptoms, are significantly distressing or impair social, occupational,or other functioning. The disturbance isn’t due to the effects of a substance (e.g. medication) nor another medical condition. The worrying isn’t better explained by another medical disorder (e.g. worrying specifically about being judged in social situations, or worrying specifically about having panic attacks in random places). Worrying is certainly a key feature of Generalised Anxiety Disorder, and these worries are targeted at multiple areas of your life (finances, health, friendships, work, studies, family, safety, etc.). Unhelpful thinking styles and unhelpful interpretations can then come into play, heightening your vigilance for potential things that may go wrong, increasing the ‘awfulness’ of the event (e.g. Catastrophising about the 'worst case scenario’) should it occur, and questioning your own ability to cope. With all of these worries going on in the mind, it’s no wonder that it can impact on your ability to focus on the task at hand. Chronic worrying takes time and energy, and this can be physically draining. Seeing potential ‘threats’ everywhere can put you on edge, cause you irritability, lead to muscle tension, or even lead to sweating, nausea, or gastrointestinal discomfort. Worrying can also keep you up at night and affect the quality of your sleep. 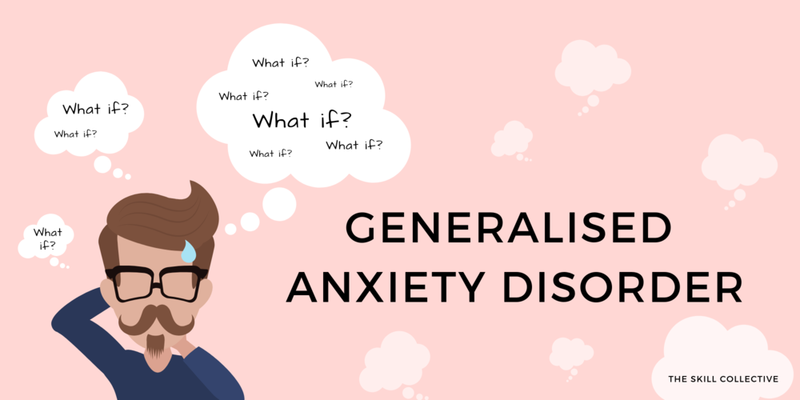 Generalised Anxiety Disorder can be restrictive, affecting your ability to carry out tasks efficiently as a result of self-doubt, fear of negative consequences, or feeling on edge. There may also be substance use (e.g. alcohol) to ‘take the edge off’ feeling agitated as a coping style. COGNITIVE BEHAVIOUR THERAPY (CBT). Cognitive Behaviour Therapy is an effective treatment for GAD. It teaches you how to re-appraise self-talk that heightens your anxiety, and teaches you how to manage your anxiety with time and practice. Exposure therapy is used as part of CBT to increase distress tolerance. MINDFULNESS-BASED COGNITIVE THERAPY and ACCEPTANCE AND COMMITMENT THERAPY (ACT). Part of the ‘new wave’ of CBT treatments, Mindfulness-based Cognitive Therapy and Acceptance and Commitment Therapy teach individuals to have a different relationship with their thoughts (detaching). ACT also encourages individuals to live alongside their worries, and move towards living a values-based life. If you’re ready to work on Generalised Anxiety Disorder, why not Contact Us for a tailored approach? If you’re keen to learn more about tips to help you with worries you can grab our Tip Sheet. You're almost there! Check your email and you're one step closer to the tip sheet on 5 Ways to Move Past Anxiety + 'What if' Worries (Tip - Can't find our email in your inbox? Check your junk mail folder, and be sure to add us to your Safe List!). Can our perception create stress? Mindfulness...it's everywhere, but is it the miracle cure it's touted to be? What to do when you can't change a situation? Should you continue to bang your head against the wall, or can you take a different approach? Evans, S. (2016). Mindfulness-based cognitive therapy for generalized anxiety disorder. In S.J. Eisendrath (ed.). Mindfulness-based Cognitive Therapy: Innovative Applications. (pp. 145-154). Switzerland: Springer International Publishing.